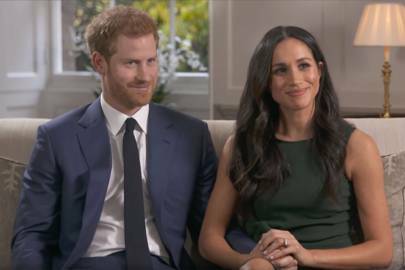 Meghan Markle and Prince Harry are officially one of the world's cutest couples and we've been living for every single public engagement after their incredible royal wedding gripped the world this year. 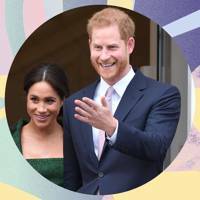 Whether they're coordinating in the sartorial stakes or Prince Harry is playing the doting husband, this power duo are the ultimate #couplegoals. 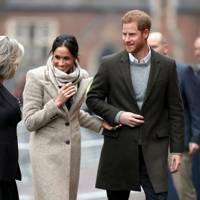 Once again, the couple proved they know how to have a great time as they attended the Commonwealth Day Youth Event at Canada House in London and as they bid goodbye to the crowds, Prince Harry sang a short snippet of So Long, Farewell from The Sound of Music, whilst Meghan mischievously chuckled. If we needed any more proof that they're our favourite couple ever, this video is it. 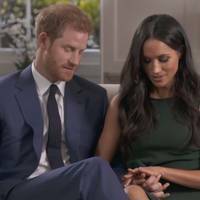 Need some more Harry and Meghan sweet moments? Of course you do. 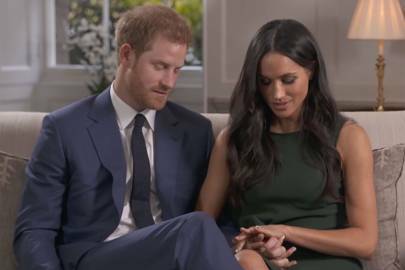 Just look at this snap of Prince Harry practising his speech in front of Meghan ahead of the Opening Ceremony in Australia. 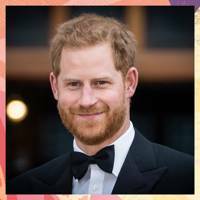 The Duke of Sussex makes his final speech preparations ahead of tonight’s Opening Ceremony. 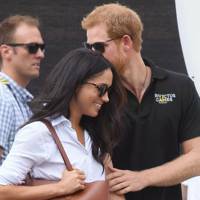 It comes after Harry was captured tenderly stroking Meghan's back and we can't get enough of it. Our hearts are basically exploding. Then they announced they're expecting their first baby and they've never looked happier, quite frankly. 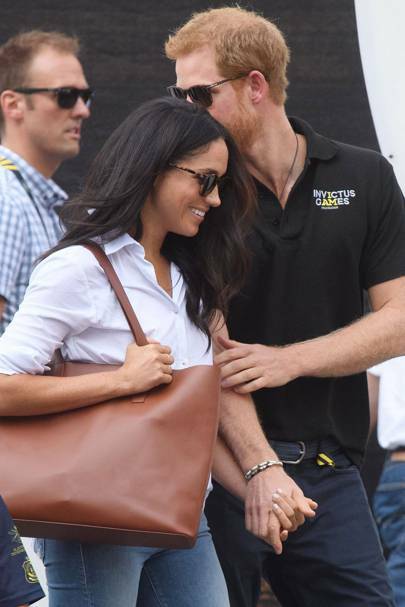 Prince Harry and Meghan Markle are currently enjoying their time down under and this photo of the couple walking hand-in-hand while Meghan cradles her baby bump is giving us all the feels. It comes after a member of the crowd called out to Harry: "Congratulations! I hope it's a girl" and he replied: "So do I". Aww! 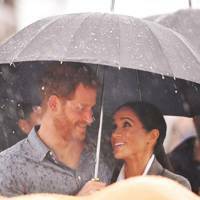 If we were going to be trapped in the rain with someone, we'd want it to be Prince Harry, too. 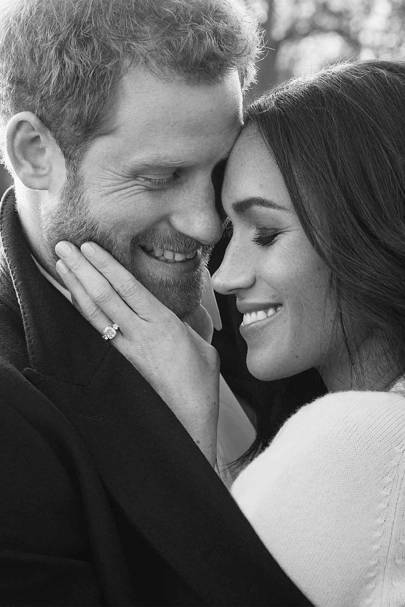 No wonder Meghan looks so damn delighted. 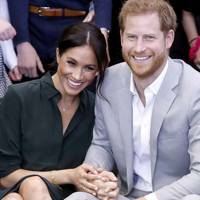 Since announcing their pregnancy, the couple simply cannot keep their hands of each other and we can't get enough of their cuteness. 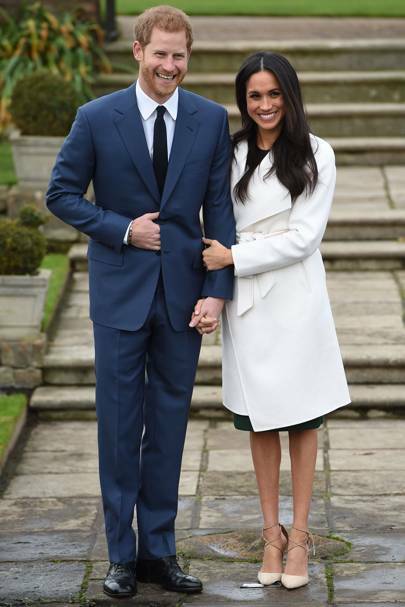 Ever since their wedding earlier this year, Prince Harry and Meghan Markle have been giving us *major* couple goals. 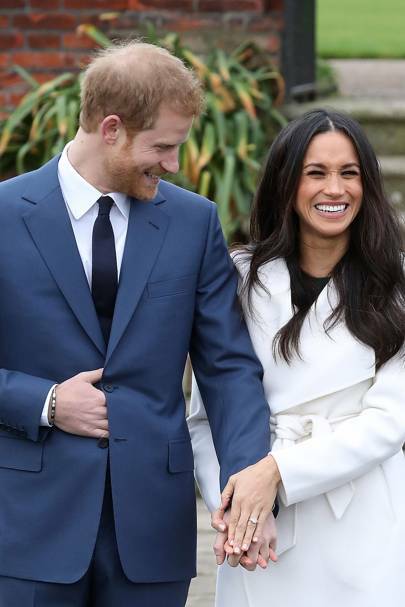 And now, we've found out Meghan's pet name for her husband - and it's a cute one. 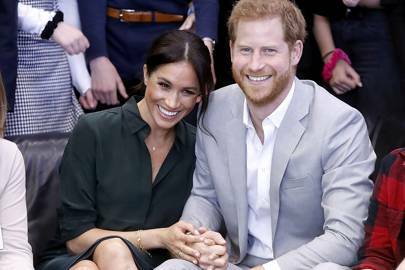 The couple were at Hamilton and posed for a photo with the cast, where Meghan was heard saying to Harry, "Can you see, my love?". How cute! Talk about the honeymoon period! 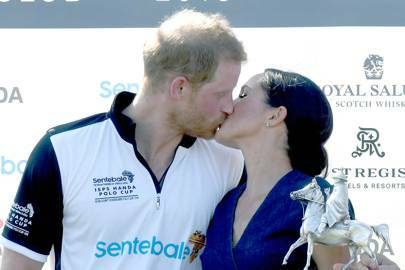 Meghan and Harry had no qualms about indulging in a full-blown smooch when Harry took his trophy at the polo this week. While we rarely see William and Kate locking lips, we're glad to see that this pair aren't afraid of a PDA. 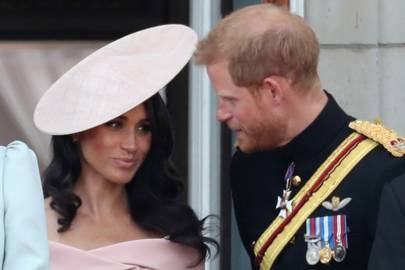 The newly married couple made an appearance on the balcony at the Trooping of The Colour and, naturally, Meghan looked incredible. 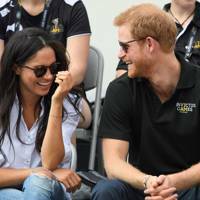 A lipreader revealed to MirrorOnline (via The Sun) that Harry reassured Meghan as they waited for the fly-past by the RAF's Red Arrows - and what he apparently said is so.damn.cute. 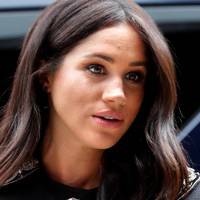 Prince Harry apparently asked her: "Okay? ", to which she apparently replied, "Yeah, are you? ", before admitting she was "nervous!". 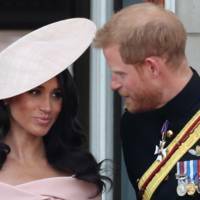 The lipreader believes that Prince Harry then explained to his wife: "Then there's the fly-past and then we all look up to the sky." What a man! 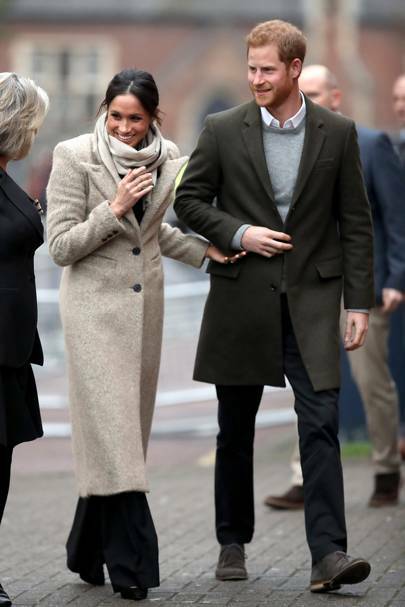 Harry and Meghan looked cute as ever as they arrived in Brixton to visit . 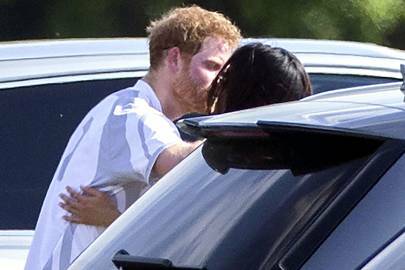 The couple were snapped kissing after watching a polo match at Coworth Park in May earlier this year. Cue an internet meltdown. 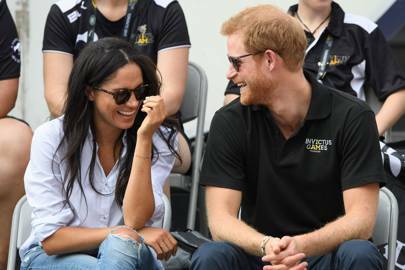 They made their first official appearance together in September at the Invictus Games in Toronto. 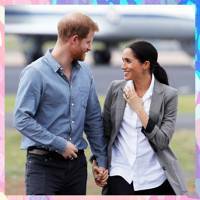 Meghan looked gorgeous dressed down in a shirt and ripped jeans, and the pair couldn't keep their eyes off each other. 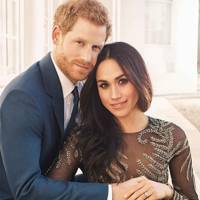 That month the actress also spoke publicly about their relationship for the first time, telling Vanity Fair: "We're two people who are really happy and in love". Could they be any more adorable? 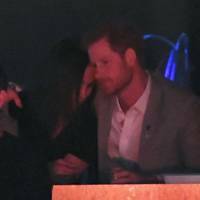 The pair were spotted looking close backstage at the Invictus Games. 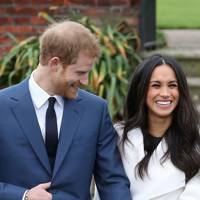 They announced their engagement with beaming smiles on November 27 at Kensington Palace Gardens. 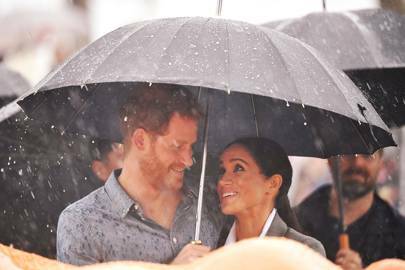 Meghan might just be the most envied woman in the world right now. 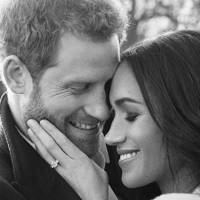 As they showed off the ring, Harry said he knew Meghan was the one from the first day they met. 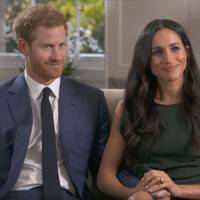 Later that day, the couple had their first TV interview in a BBC special. They revealed they were set up on a blind date by a mutual friend and said Harry proposed in their London cottage. 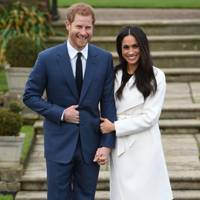 It got quite emotional when the prince spoke of his late mother, Princess Diana, saying he believed she and Meghan would have been "best friends". Congrats to our new favourite couple! 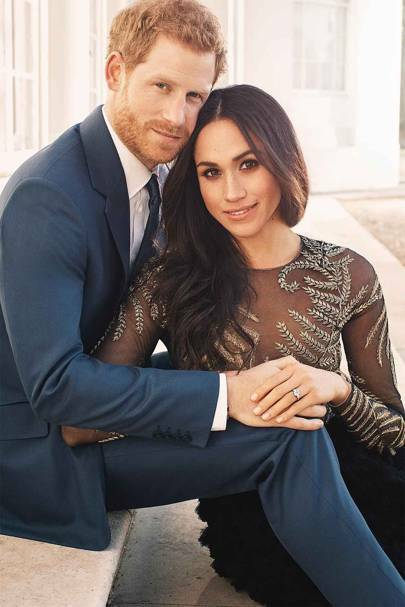 Alex Lubomirski said: "It was an incredible honour to be asked to document this wonderful event, but also a great privilege to be invited to share and be a witness to this young couple's love for one another."